A lovely late summer day, a day to be spent on the beach or relaxing by the pool, and the start of Labor Day weekend so an extra day's relaxation to look forward to. Bliss. So what do we do? We look at the circular drive that we can now see from the dining room and den and decide that we need a fix for that flooding problem, and we need it NOW. I had found a great stoneyard, Mother Earth, and so we went to look at the river rock and pebbles. our idea being that we could create a channel that would slow down the force of the run-off and cut the erosion. Three hours later a bin of river rock was delivered (this place has the best service) and Steven started to create. After a dip in the pool, two Alleve and several glasses of red wine he finally stopped complaining about the pains in his back and knees and fell into bed. 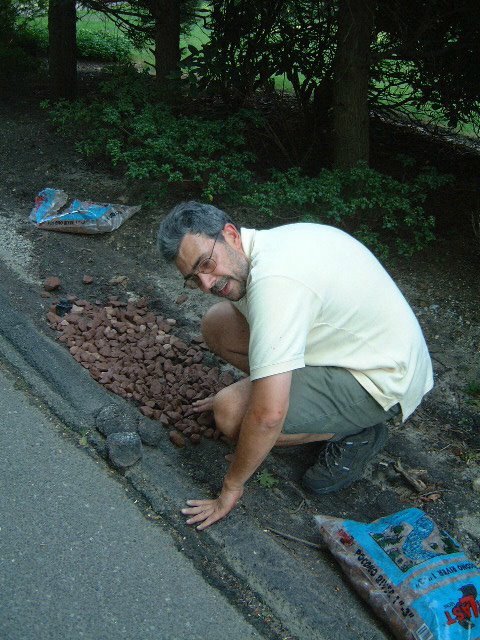 The next day he quickly completed the job, and neighbors stopped to say how great it was we were tidying up the front. On Labor Day I transplanted some hostas from the backyard to the new riverbed. I hope that they will do well here as they'll get more sun and have more space to spread out. It looks so pretty that Steven wants to order another bin of stone and continue along the front of the property even though we don't have an erosion problem there. He must have forgotten how much hard work it was. We'll see if he still feels the same way next weekend. We finished the holiday by removing the last carpet, which went much faster than the others. Either it was newer and had less dirt on it or we have it down to a fine art now and can go into the carpet stripping business. I slapped a couple of coats of paint on a bedroom closet and we are all ready for Pete to install the bamboo in the other bedrooms.